When I decided to start this personal challenge, I wanted to contribute to organizations that were/are close to my heart or have mandates that I feel a personal connection to. When I lived in Dawson, KIAC was a big part of my life and my community. Hi Caili, what were you doing when you decided to make a monthly contribution to KIAC? My decision to start making a monthly donation to KIAC came about when I made the choice to challenge myself to support one community organization each year that is important to me. I decided to provide this support by donating $15/month to said organization over 12 months. Not a significant amount, but I also understood from my experience working for non-profits that small amounts can go a long way in small organizations. Why do you value KIAC? I value KIAC for so many reasons! When I decided to start this personal challenge, I wanted to contribute to organizations that were/are close to my heart or have mandates that I feel a personal connection to. When I lived in Dawson, KIAC was a big part of my life and my community. I volunteered, went to shows, produced shows, taught, worked, and hung out at KIAC on and off for several years. Thank you Caili from the entire KIAC community! KIAC is a Registered Charitable Non-Profit Organization and as such can issue tax receipts for donations. By subscribing for $15 a month, Caili earns a combined yearly tax credit of $38.52! You can calculate other amounts at the Canada Revenue website or contact us directly and we’ll help set up a plan that works for you. Indulge your inner serial supporter today and subscribe to monthly donations below to help our 20/20 Campaign reach our goal – any amount is appreciated. Thank you! 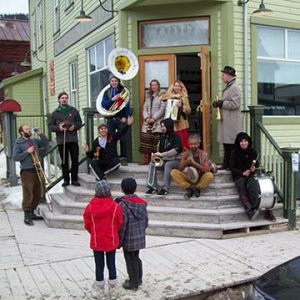 At the edge of the arctic circle, KIAC is: ODD Gallery contemporary art; Film Fest; Arts Fest; Residency Program; The Natural & The Manufactured; lectures, screenings, projects, performing arts, workshops, courses. KIAC is a partner of Yukon SOVA. Every month for twenty months, we’ll be featuring one of the hundreds of exceptional volunteers who help make KIAC’s programs possible. Thank you! KIAC would like to give a hearty THANK-YOU to Erika Marzinotto and Jimmy Boddie! Over the past few years their support and commitment has had a really big impact on what we have be able to accomplish! From selecting exhibitions and artists to hosting artists, openings and fundraising events; from painting and prepping for installations to tearing it all apart and re-painting for the next one; from writing to the odd emergency electronics repair job…. We have a lot to thank them for! Learn more about Erika and Jimmy and our other volunteers on our 20/20 Volunteer Recognition Page.